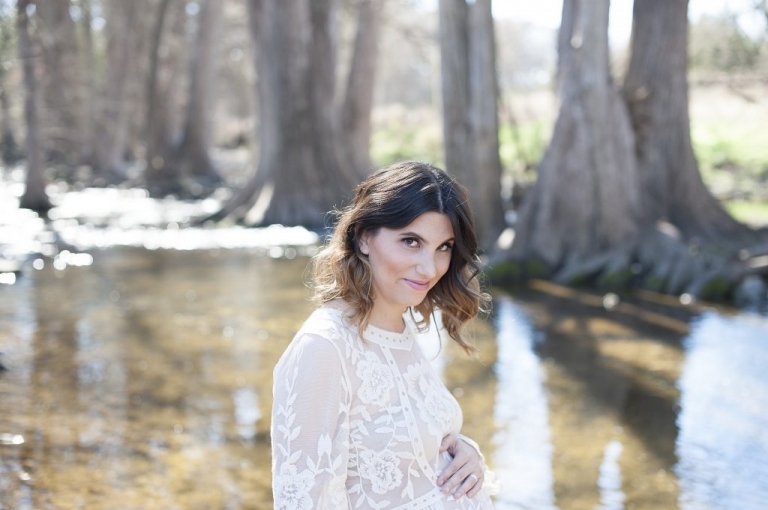 I had the perfect place in mind for Leslie’s maternity session and Cibolo Nature Center did not disappoint. I could have spent all day there walking the trails and watching the creek rush by. I knew I had wanted to incorporate my new maternity gown into the session as well. With the river setting and the lace gown we were able to create some stunning images! This pregnancy is super exciting for Leslie. She is already a mother to two twin boys and now she is expecting her first baby girl! Gone are the days when everything is peppered with hot wheels and action figures. The future will bring loads of pink and ribbon and bows and glitter and all the other lovey things that girlies bring along with them. Before I had my boys I would day dream about having a little girl and all the fun stuff that would come with it. Decorating the nursery, cute little outfits decked out in lace, and hair styling. Well, those dreams did NOT come true for me (which is totally ok with me at this point in my life) so I cannot get enough of clients and friends telling me their plans for their new little girl. It was so fun getting to chat about Leslie’s future plans for her baby girl. She told me that she and husband David decided to name her Brooklyn. Oh my goodness, how precious is that? That is the exact name we would have chosen if we had a girl 😉 I am so happy to have had the honor of documenting this pregnancy for Leslie. I want her daughter to look back and see how beautiful her mama was when she was growing inside her. © 2019 Samantha Sloan Photography|ProPhoto 6|Design by Northfolk & Co.